I say that drag racing hot rods on sandy beaches is stupid. But then, some say that many things I say are stupid. Go figure. That was my immediate reaction when I first saw reports of The Race of Gentlemen (TROG) on the Jersey Shore a few years ago, but I decided I wasn’t going to say anything. Then recently the topic was broached, and debated, in the pages of Hot Rod DeLuxe, so I figured I’d add my two cents. But the more I thought about it, the more I puzzled, and surprised, myself. To start, my reasons might be different than yours. Several argue that cars have been raced on beaches since the earliest days, notably Daytona and Ormond in Florida and Pendine Sands in Wales. A surprisingly streamlined Stanley Steamer set a world record of 127 mph at Ormond in 1906, then crashed the following year at 150. But these wide, long beaches, which were exceptionally smooth and hard at low tide, were used for flying-start, top-end “land speed” record runs, not side-by-side, flag-start drag racing. At around that same time Henry Ford, using modified and streamlined versions of his hardy new Model T, equipped with studded tire chains, set similar records on wide, flat, frozen lake surfaces in mid-winter Michigan. To race around on California’s many sand dunes, hot rodders invented dune buggies decades ago, using stripped-down bare frames, set-back engines and seats, and dual or balloon rear tire for traction, as seen here at Pismo in the early ’60s. many experiments, and constant evolution, of methods for improving traction, especially at the dead-stop starting line. So it seems totally incongruous, to me, to hold drag races on soft sand, or even on dirt, as is now being done in Colorado. This of course brings up the subject of racing vintage, supposedly valuable, machines in a hostile environment, where the cars themselves can get filthy or even damaged, and the engines inevitably ingest abrasive sand or dirt. Why subject your hot rod to that? Well, some respond, hot rods were raced on the dusty, alkaline dry lake beds from the beginning, in lieu of any paved strips (other than city streets) for similar racing. But, again, this was for flying-start top-end speed runs. Plus, if you’ve ever driven across a hard, dry lakebed like El Mirage, you know how incredibly smooth and solid it is–better than I-5 by far. But yes, it gets the car filthy and you have to try to protect the engine as best you can. Plus, as an automotive historian I know full well that cars were raced on dirt oval tracks, such as county fair horse tracks, from the very earliest days. And even after paved or board banked ovals were built for “big car” auto racing, quarter to half mile dirt ovals proliferated across the country for roadster racing, in which many hot rod roadsters–even street-driven ones–participated. Hmmm. Furthermore, I have been building (with Marty Strode) just such a dirt track roadster, a very close copy of the Spalding Bros. 12-Port Chevy ’22 T, which we plan to debut in bare-metal at the next GNRS show. And, yes, I have joined the WRA and fully intend to race this car, for exhibition and fun, on remaining local dirt ovals when it’s done. Dirt track racing, and turning right to go left, is about as dirty and illogical as racing gets. Did I mention dirty? The photo above of the bright orange Spalding car was the one that appeared on Hot Rod’s Feb. 1950 cover. The more mud-splattered sprint cars seen here and at top were photographed by me from the infield at Ascot in 1980, while that track was still alive and didn’t allow wings. But now I’m thinking: Is this kind of racing crazy? Yes. Is it exciting? Yes! Is it dangerous? Certainly could be. Is it fun? Hopefully so. This is leading my mind in too many directions at once, so bear with me. My first objection was that drag racing on sand negates traction, one of its primary objectives. But what about the second half of the ’60s, not to mention nostalgia drag racing of the ’80s-’90s in which I heartily participated, when traction went out the window in a blaze of blue tire smoke and drivers learned the new art of controlling chaos. two dune buggies pulled up side-by-side and raced to the top of the hill. I have no idea what’s become of it today, but by 1981 when I took the above photos, it had progressed to dual-paddle-tired, nitro-fed Top Fuelers and Funny Cars slinging sand on timed “strips.” Who are building dedicated “TROG” cars now? What’ll come next? You know it’s inevitable. Dirt-tracking to the top of Pike’s Peak. 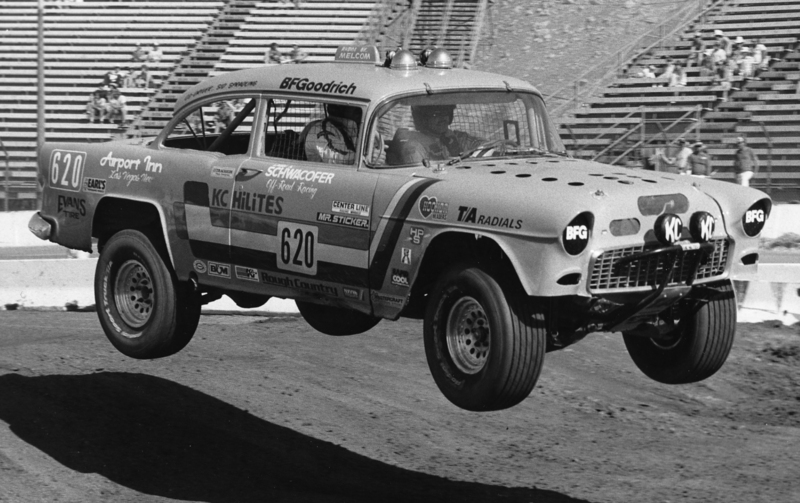 “Off-road” racing–in a ’55 Chevy sedan–inside a stadium. They call this “Rallying,” a supposedly gentleman’s sport. So you see where this has taken me. I guess you really couldn’t call any sort of auto racing intelligent or logical. “Noble” probably comes closest, especially for contests like Indy or Grand Prix. But, you have to admit, in the pantheon of auto sports, plenty could be considered downright stupid. But so are plenty of other things we humans do. So let’s fish for some more positive adjectives. Like exciting, zany, thrilling; maybe creative; but most of all fun. If this TROG thing is fun for the participants, as well as the spectators, and so far apparently harmless, who am I to disparage it? Wellll, just a couple of things, very briefly. First is the name. I’m sorry, but hot rodders are not gentlemen. We wear Levis and T-shirts and belong to clubs called Lowflyers and Bungholers. Gentlemen wear blazers and penny loafers and show their cars at Pebble Beach. And TROG rhymes with blog. Second, I have no intention of racing my hot rod in the sand. But I do have a vintage dragster that I would really like to run down a paved, timed, quarter-mile strip. The problem is that there are very few of those left. And the couple that are anywhere near are sponsored by an insurance company (Auto Club), and don’t want anything like my car running down the track–even at the Antique Nationals or other “vintage” events. So I’m relegated to running the untimed Eagle Field 1/8-mile (above), some 300 miles away. My hope, in closing, is that more of these paved strips, which are surprisingly plentiful around the country, can find ways to host such low-key, not-necessarily-competitive, vintage racing events. One very successful one held recently on a private landing strip in Santa Margarita, CA, was called the RPM Nationals. So race on the sand if that’s your thing (and there happens to be a beach in your area). But I’m hoping for more amateur-organized, run-what-ya-brung hot rod events, so we can all have some fun.